Maxmara put forward a called teddy bear coat series in their 2018 new winter collection. 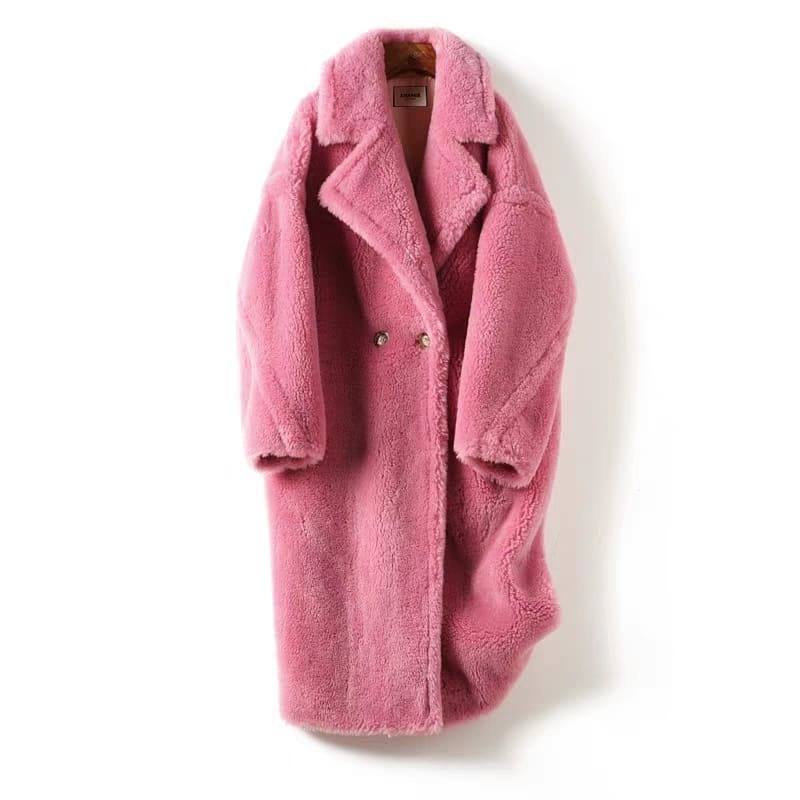 The teddy bear coat actually is made of one kind of 100% wool fabric. The surface of the fabric is plush looking and soft feeling. The teddy wool fabric looks like a luxury teddy bear fur that’s why the designer from Maxmara call this coat collection Teddy bear coat for their new winter collection. since the first day, the teddy wool coat goes to the Maxmara’s shop, it was really a big success. Actually, during the T show, when the models wear the teddy wool coat comes to the showground, the overwhelming fashion effect shown over all the clothes fashion hall. The fans all were shocked for the luxury looking of the teddy bear wool coat series. Before we talk about the teddy wool coat, we should learn about the teddy wool fabric first. The teddy wool fabric is a kind of long pile fiber fabric. This kind of wool fabric ‘s surface looks like fur touch feeling. They made this kind of shearling wool fabric in Germany mills at the beginning. Later Italy wool fabric mills also successfully copy the right quality out exactly. A few months after, China wool fabric mill UNITEX also developed the exact same quality fabric out. Maxmara also starts to order the teddy wool fabric from the fabric traders who buy from China. Teddy bear wool fabric’s production process is a really complicated process. The fabric needs high-quality long pile wool fiber. Unitex selected the best wool fibers from Australia for the wool raw material. Unitex checks the wool fiber each bulk carefully with one professional fiber test measuring instrument. Only the fiber length meets the certain standard which can be selected to put for spinning purpose. Correct wool fiber length is key important for the teddy bear wool fabric‘s touch feeling. In order to make sure to get the luxury fur effect for the teddy bear wool fabric, Unitex organized a strict quality check team to supervise the whole wool raw material selection process. Unitex uses a lot of measuring instruments in the process in order to guarantee the wool fiber quality standard. Yarn spinning for the teddy shearling wool fabric is also strict control process. The machine speed, workers” skills, environment temperature as well as air humidity all are very important to guarantee to spin the correct yarn out. After the spinning process, we will get the single yarn only. once we finished the wool fiber selection, we can go into another workshop called yarn twisted workshop. To get enough furs or fiber piles, the workers have to twist two single yarns together to make into a thick singer yarn. we call this thick yarn double yarn. After the yarn twisted process done, then the process will go to the weaving workshop.workers will take the twisted yarn to the weaving workshop to make fabrics. After the above steps finished all, the last process is to Dye and boiling, this is the last but the most important. UNITEX IS A PROFESSIONAL TEDDY WOOL FABRIC MILL. Unitex welcome customer from all over the world to visit our wool factory and establish a long term business relationship.